Cochineal cactus, photographed at Seacreast Scrub Natural Area, Boynton Beach, Palm Beach County, in September 2013. Think about cochineal cactus, Opuntia cochenillifera, next time you take a sip of a red-tinged drink or see someone apply red lipstick. Oh and don't forget the bug that lends its name to this plant and plays a crucial role in this story. Cochineal is a member of the pricklypear family, probably native to Mexico but widespread throughout the world's tropical regions. 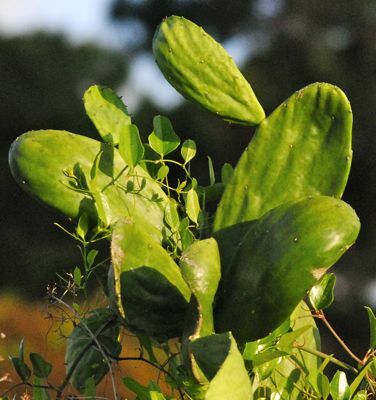 It's not native to Florida, but grows wild in a handful of counties. Hawaii is the only other state where it's naturalized. The cactus gets its name from the cochineal insect, Dactylopius coccus, that lives on it and other members of the opuntia, or pricklypear, species. The name derrives from the Latin word for red or scarlet, and refers to the dye made from the crushed bodies of the bug. Yes, that stuff you're putting on your lips or to your lips, might be partly made from bug juice. Pre-Spanish Mexicans domesticated the bug to make dye. When the Spanish came, they found that the Aztecs had a superb scarlet dye, far more brilliiant than anything used in Europe, and that the bugs were the source. After the Spanish conquered, Mexico, cochineal dye became a major export, second only to silver. Michaelangelo used it in his paints. It takes something like 70,000 cochineal insects to make a pound of dye, so it was a relief to the species when chemists discovered synthetic red dyes in the late 19th century. However, in the late 20th century, it was found that many of the synthetics were carcinogenic. That, plus, a trend toward favoring "organics," caused dye makers to return to cochineal. Several years ago Starbucks quit using the dye in its drinks and pastries when vegans and others protested the practice. Starbucks replaced cochineal with lycopine from tomatoes. Cochineal is still used commercially in drinks, foods, lipstick and candles. (Look for carminic acid on the label.) 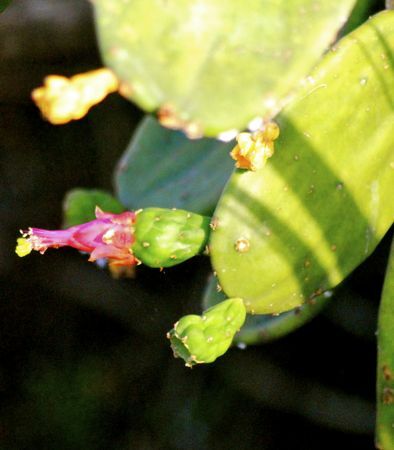 Cochineal cactus, particularly the pads, is also used in remedies for circulatory problems, to relieve pain after birth, stomach issues, particularly ringworm, urinary tract problems and arthritis. It's also used in soap and shampoo. The pads and fruit are edible. The use of the bug to make dye is the major reason why opuntia species, including our guy, are found throughout much of the world, in some places to the point that they've become environmental pests. Cochineal cactus, however, is pretty well behaved in the wilds of Florida. Cochineal cacti look very much like your standard variety pricklypear, except for two things — it's much bigger than most pricklypears found in Florida, and usually lack the sharp spines that other cactus members have, possibly the product of selective breeding. The pads are mostly smooth but may have tiny, nasty hairs called glochids. 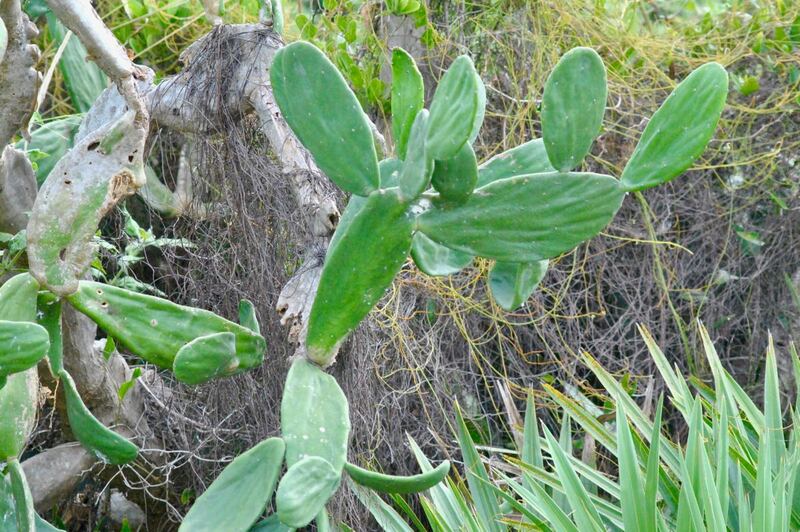 It does have the jointed pads that distinguish pricklypears from other cacti. It can be as tall as 15 feet or more, but usually less. 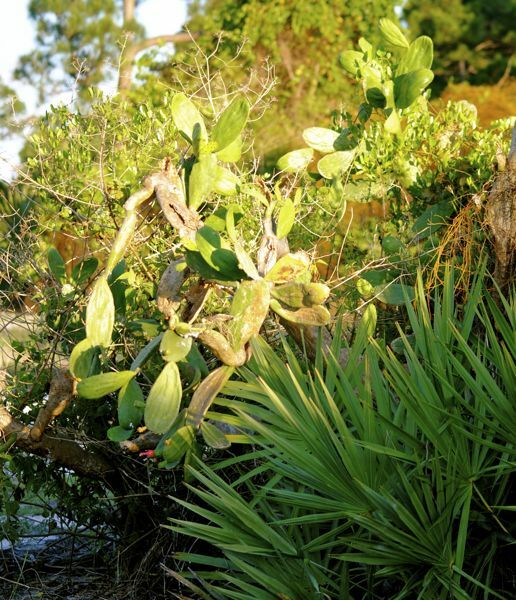 It likes sandy soils — scrubs and dunes — and will grow in dry, tropical forests. The flower is long and narrow and red, blooming fall through winter. The fruit is a red berry. Cochineal cactus is grown here as an ornamental, and will thrive as long as it has sun and well-drained soil. 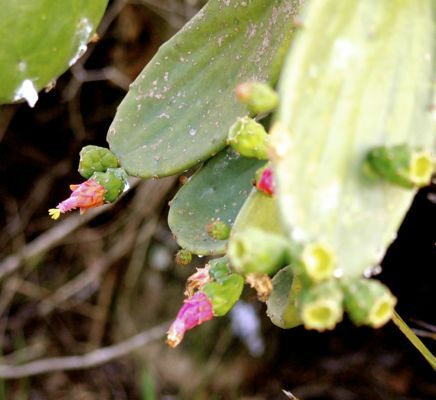 It can be grown vegetatively by simply planting a piece of the pad in the ground — which is the method the Mexicans used for cochineal production. The flowers attract nectar lovers, including bees, butterfiles and hummingbirds. It's also host to the cactus moth, Cactoblastis cactorum. Since the 1920s, the cactus moth has been used as a biological control in places where pricklypear species has become invasive pests. 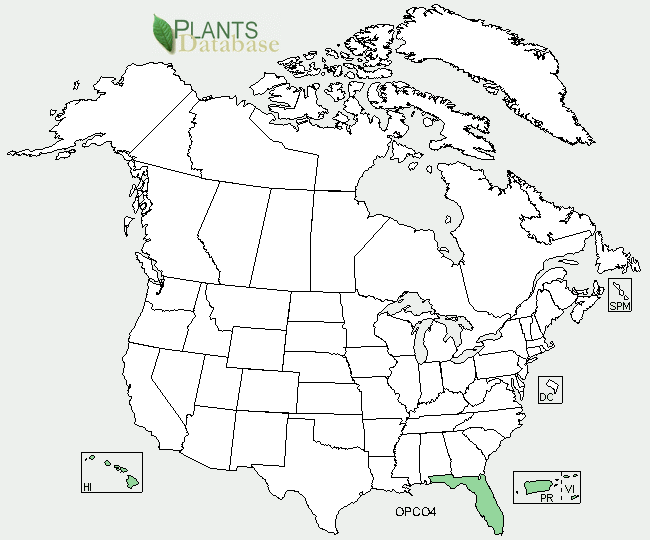 Apparently, it was deployed in the Caribbean in the 1980s and somehow made its way to the Florida Keys, worked through the Peninsula and along the Gulf Coast, attacking native pricklypears and exotics ornamentals, like cochineal, to the point that it's become an invasive menace itself. Now, researchers are develoing a biological control agent for a biological control agent. As might be expected with a plant that is so widespread over the globe, cochineal cactus is known by numerous common names, including French prickle, white tungy, cochineal nopal, nopal cactus and velvet opuntia. There is at least one commonly used scientific synonym, Nopalea cochienillifera. Cochineal cactus is a member of Cactaceae, the cactus family.